On Jan. 25, the College hosted its annual Martin Luther King Jr. Social Justice Award ceremony as part of its Martin Luther King Jr. Day celebrations. The awards seek to honor achievement in social justice by members of the Dartmouth community. Five people and one organization received awards this year: George Boateng ’16 Th’17, Zachary Kaufman ’08, sociology professor Deborah King, Tuck School of Business director of strategic initiatives Dia Draper, Pat Terenzini ’64 and Alpha Kappa Alpha sorority. Boateng received the Emerging Leadership Award. In 2013, Boateng co-founded the Nsesa Foundation, which seeks to encourage young people in Africa to innovate and solve problems within their communities. The organization runs several programs, primarily in Ghana, Boateng said. It has a three-week summer program called Project iSWEST, an abbreviation for “Innovating Solutions With Engineering, Science and Technology,” for high school students. In the past five years, the camp has impacted 100 students, according to Boateng. The foundation also runs STEM WOW, an abbreviation for “STEM Woman of the Week,” which seeks to highlight African women in STEM through social media. This is the foundation’s first program to expand out of Ghana. Boateng said he hopes it will encourage girls to study STEM, adding that he plans to compile inspirational stories into a book that schools across the continent can use to inspire girls. SuaCode, the foundation’s newest program, uses smartphones to teach people across the African continent to code, Boateng said. “We just tapped the tip of the iceberg in terms of what we can accomplish,” he said. Boateng, who grew up in Ghana, said he disliked that the education system focused on memorization, which inspired him to create Nsesa. According to Boateng, he will start at ETH Zurich as a Ph.D. student in the near future. The Xi Lambda chapter of Alpha Kappa Alpha received the Student Organization Award for its commitment to Dartmouth’s women of color and its community service, according to the award website. Alpha Kappa Alpha is a black sorority that was originally founded in 1908 at Howard University, according to sorority president Alex Adams ’18. The Xi Lambda chapter was chartered in 1983. 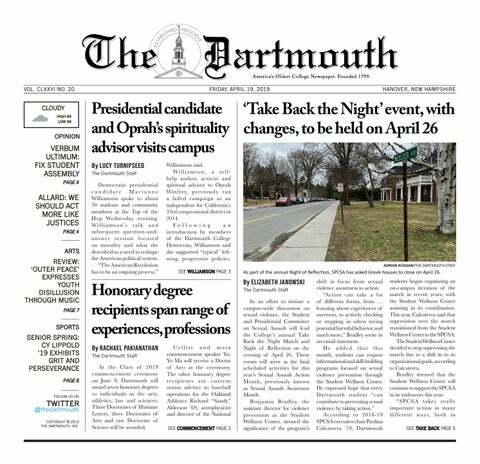 Adams explained that the sorority primarily focuses on outreach and advocacy within the Dartmouth community. This year, it hosted a sleepover for first-year women of color to meet upperclasswomen of color, she said. The sorority has community dinners and events, such as a ski day, to “create spaces for marginalized people, especially black women,” she said. Alpha Kappa Alpha also partners with national organizations to advocate for different causes. For example, next Saturday the sorority will host an event to raise money for the National Alliance on Mental Illness. Kaufman won the Ongoing Leadership Award. Seven years ago, while overseeing data management for an organization called Grassroot Soccer, which uses soccer to educate young people in developing countries about global health issues, Kaufman found that Microsoft Excel was not a powerful enough tool to manage the program’s growing number of participants. He then created Vera Solutions, which helps social impact organizations better manage and use their data. For Kaufman winning an award from Dartmouth is meaningful. Terenzini, who won the Lester B. Granger ’18 Award for Lifetime Achievement, agrees with Kaufman’s sentiments, explaining that his experiences at Dartmouth inspired him to care about underserved students’ college experiences. Terenzini’s book, “How College Affects Students,” which he published with Ernest Pascarella, compiled thousands of studies on college students. Draper received the Holly Fell Sateia Award for her leadership in advancing diversity and community at the College. King received the MLK Social Justice Award in Lifetime Achievement, which is awarded to those who have worked in their field for more than 20 years. Draper and King did not respond to requests for comment. The awards are cosponsored by the MLK celebration committee, the Office of Institutional Diversity and Equity, the Center for Social Impact and the Geisel School of Medicine.